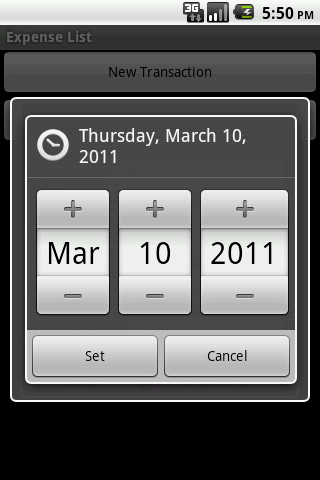 Now this will show the datepicker dialog with initial value as date shown in edittext. Now any date set in the dialog is displayed back in our edittext widget. Observe that we have used monthOfYear+1 because in Android Jan is 0 not 1. The first parameter is the context, so you should replace ExpenseList.this with your activity name.this.